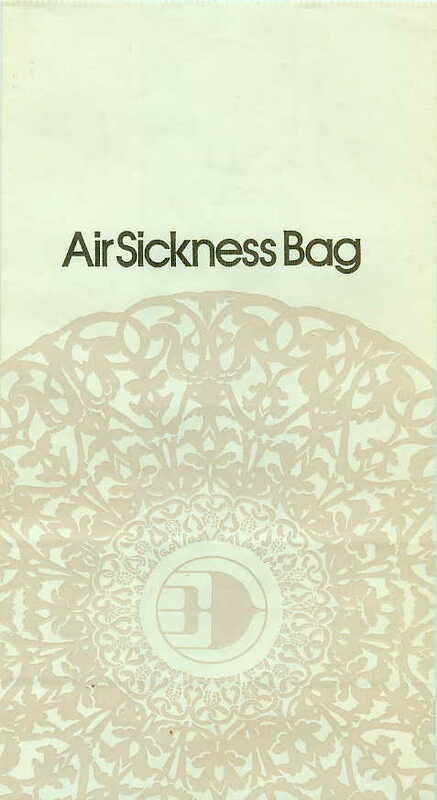 Welcome to the Air Sickness Bag Virtual Museum! Museum currently exhibits 3011 unique bags. OK, Bag Monster is a moronic name, but Monster has become a catch-all phrase for "Hey, this will help you do something" This section will help you find the bags you're looking for (like you're really looking for them). 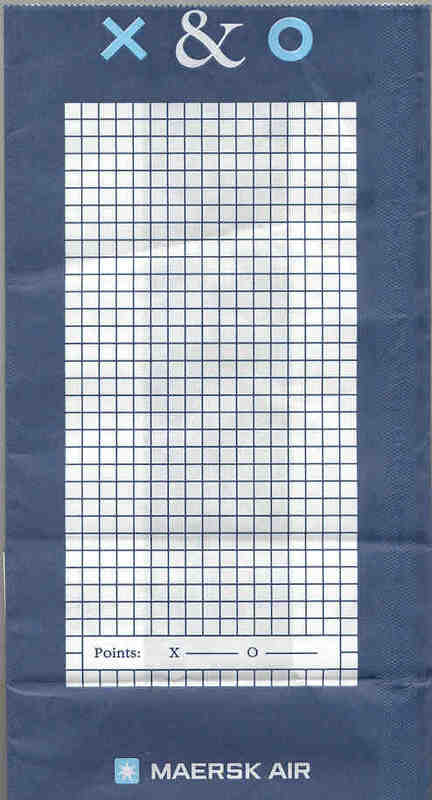 Leaving everything blank will retrieve a list of all bags, however that may cause the page to load slowly. 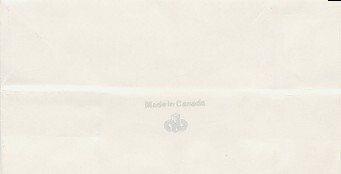 I guess the logo you see is some internationally recognized symbol for Canada. What a great old bag. 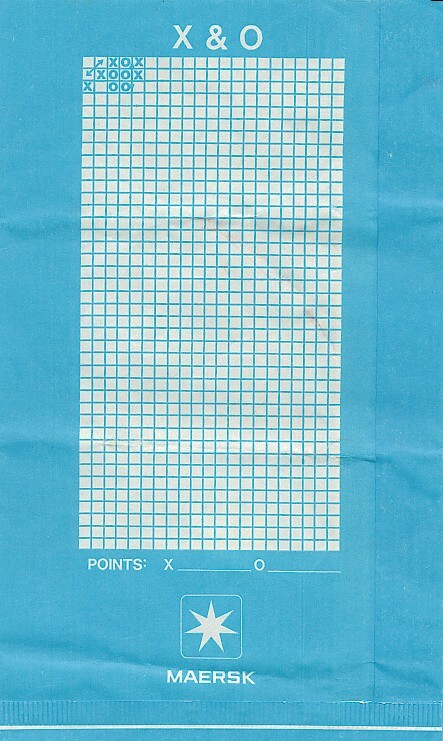 Nice vertical stripe, plus enough places to play 48 games of "X & O". They could have allowed 50 games, but they felt the need to treat passengers like morons by showing example games. 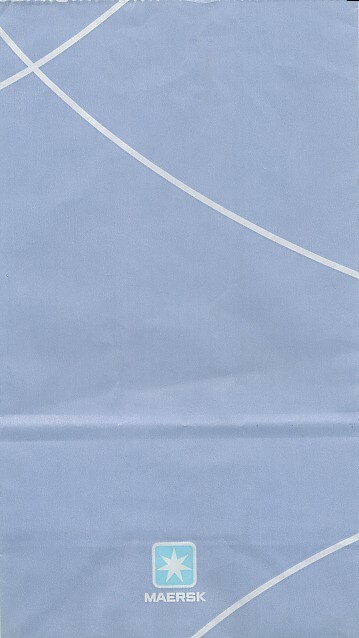 For some reason, I like this Danish carrier's bags. Boy those Danes and Norwegians sure love their X and O game! 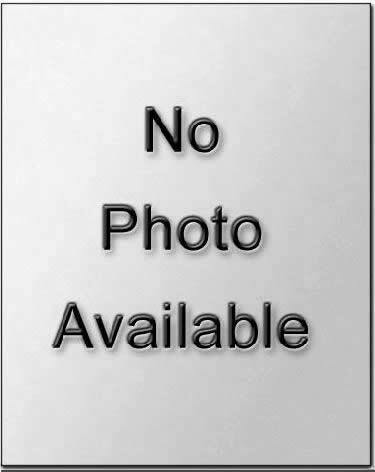 Despite calling the game 'Luftfarts-Skak' (Air Fart Chess? 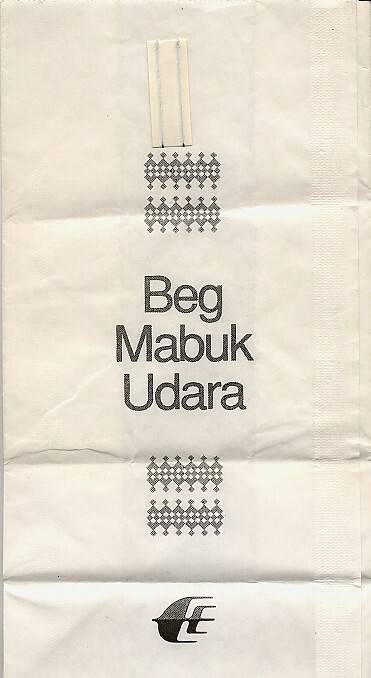 ), the bag is a winner. 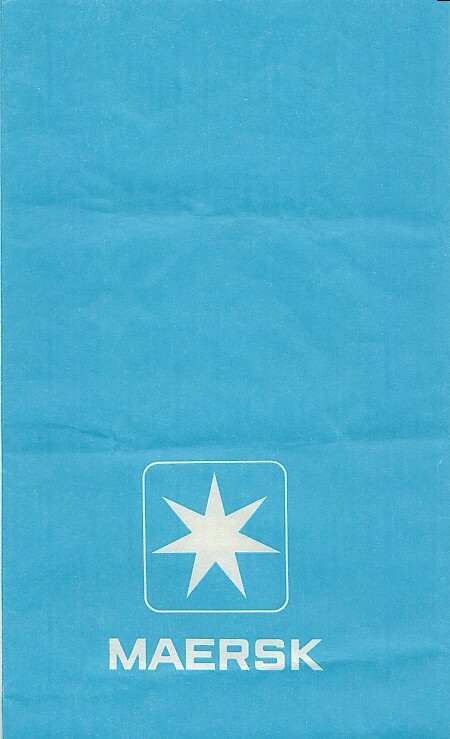 Maersk gives itself 4 big stars and a great bold design that says "use me!" 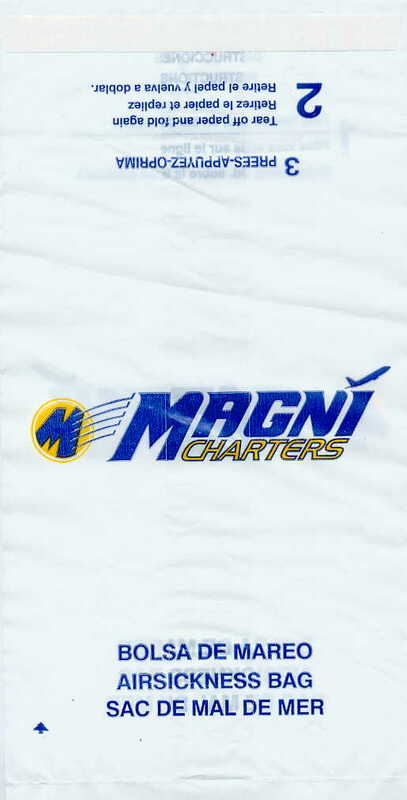 According to Mr. Funch, Maersk Air is a charter from Copenhagen operating a fleet of 20 B-737's. It's a subsidiary of the enormous shipping conglomorate. 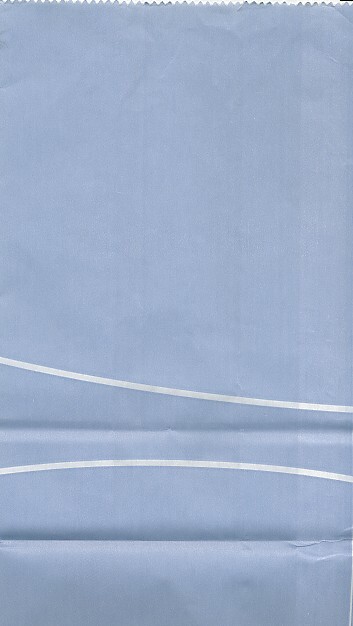 Maersk goes Eurowings-ish, with random curving lines all over the bag. 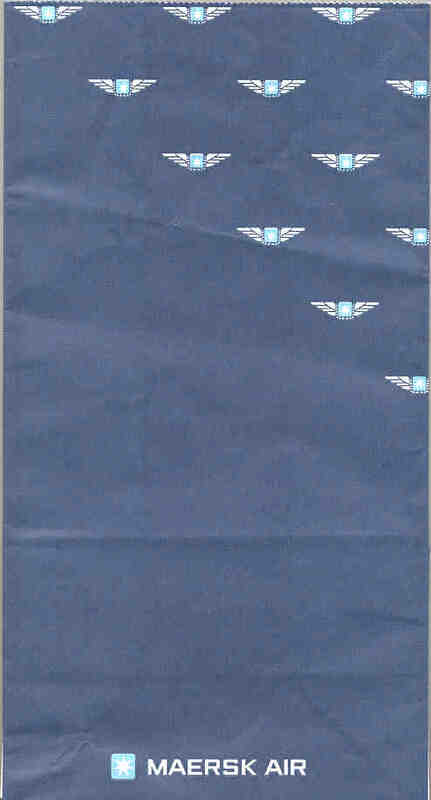 Ulrik Christensen says that Thomas Homer Goetz claims that this bag is "a temp. 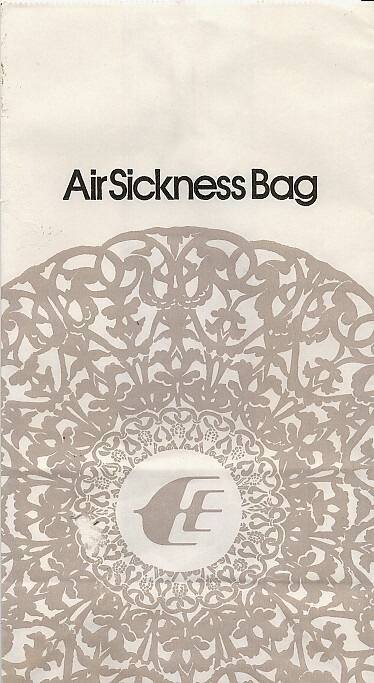 bag used in a short period of time, before the airline has a new designed bag ready." Wow! They have a bag just to fill their temporary design needs. Now why can't American carriers get with the program and stop with the generics? Back to a historical look for Maersk with the Aqua coloring. 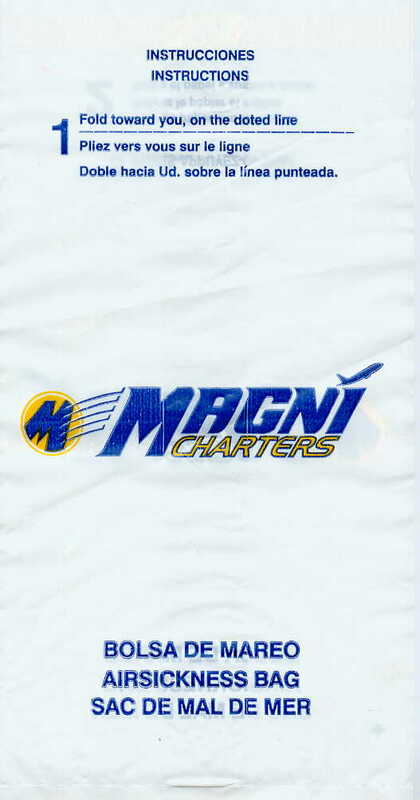 Although the name of this charter airline is reminiscent of the Magni-Save on some pinball machines, what I really appreciate is the Fro' Pick logo. 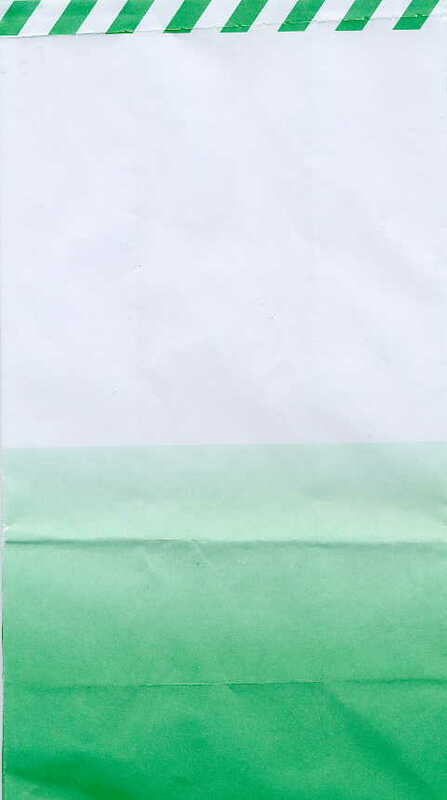 This bag fades from dark green to light green. Interestingly, it stops midway to white instead of going all the way. 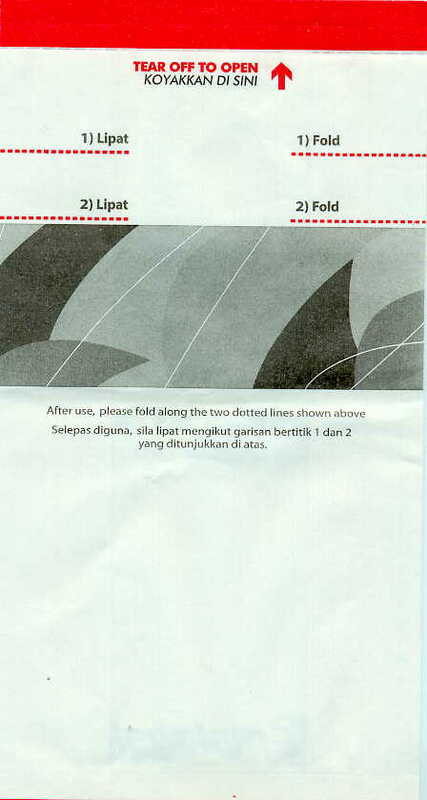 You'll understand this when you see the scan. 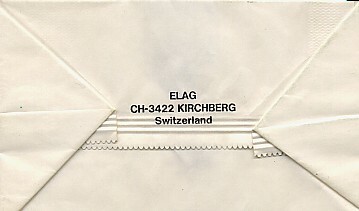 Bag features a tiny bullet hole indicating that hostilities are never far away. 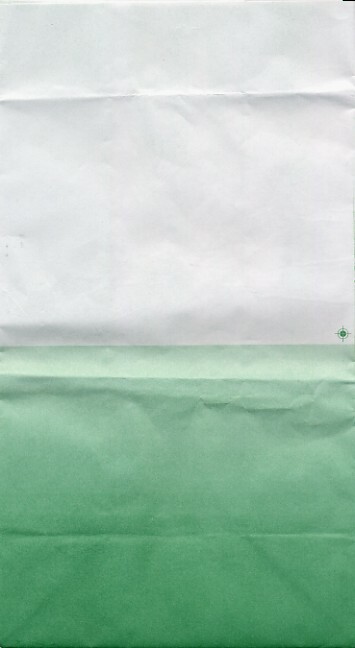 This bag fades from dark green to light green. 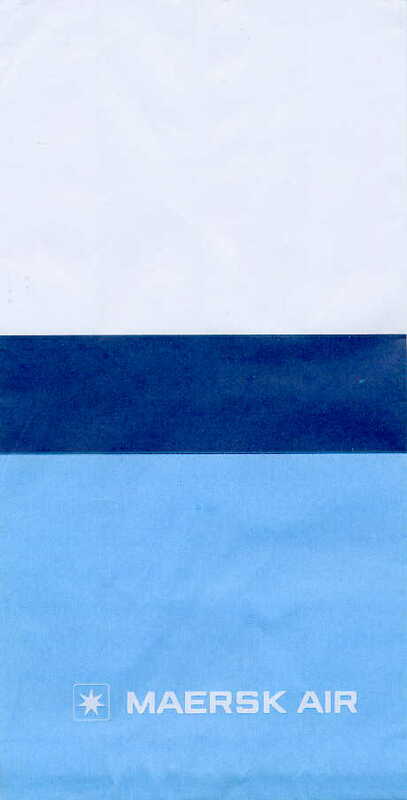 Interestingly, it stops midway to white instead of going all the way. You'll understand this when you see the scan. 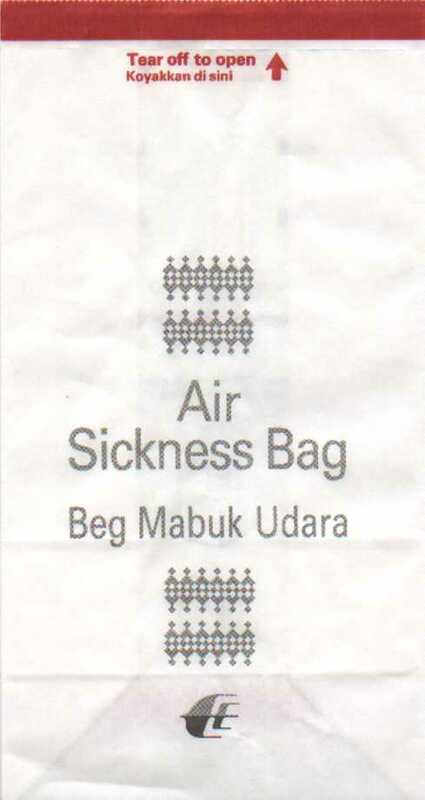 Bag features a safety zone / landing strip at the top of the bag. Ivy graces this Iranian bag. I suppose some designer might have hidden an Arabic message in the stylized ivy design. 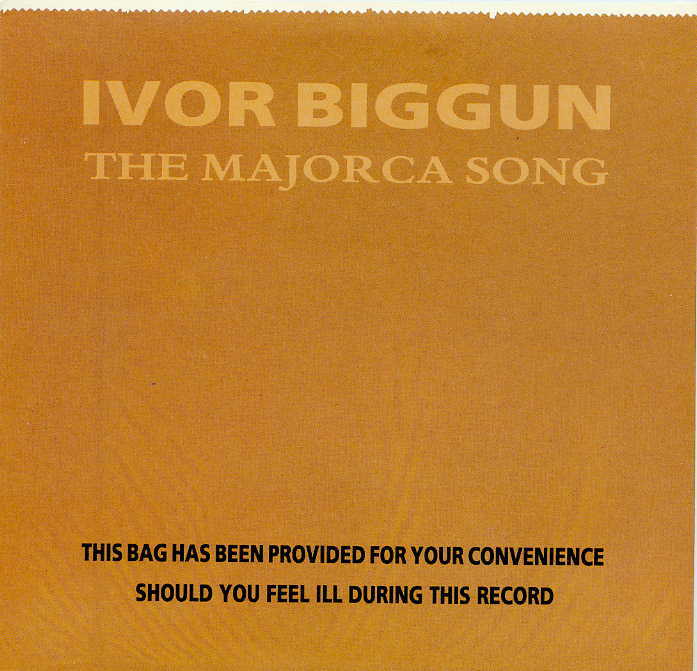 This barf bag doubles as a sleeve for a 45 RPM record called 'The Majorca Song' by Ivor Biggun. 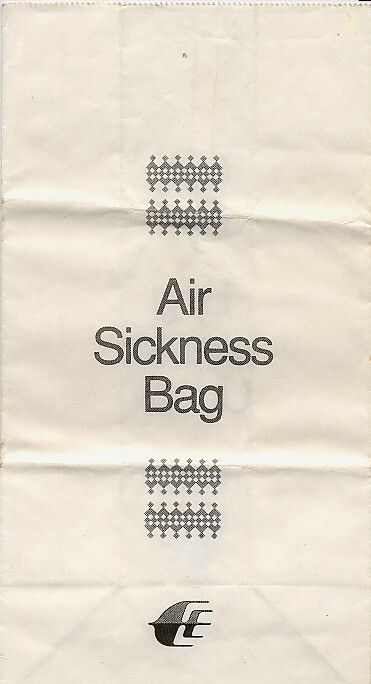 The bag says, "This bag has been provided for your convenience should you feel ill during this records". Unfortunately, I don't have a record player that can play 45s, so I'm going to send it to some guy I know from from Majorca. Apparently, the lyrics of the song are filthy because one version is 'clean as a whistle' while the other side is 'Only to be played by those old enough to know better'. The record label is Dead Badger Records. 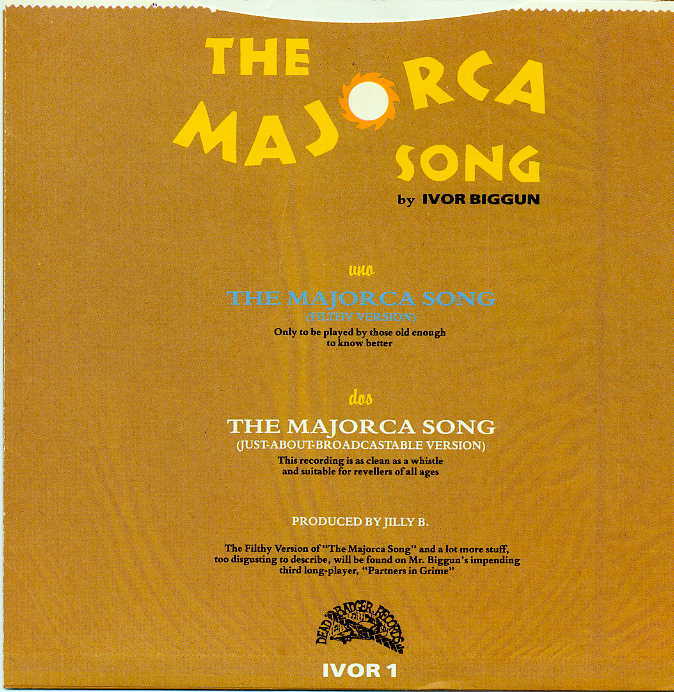 You might recognize Ivor Biggun's "Bra Size 45" that got some air play on Dr. Demento. The design on this looks like leftover wallpaper trim that doesn't go all the way around wall. 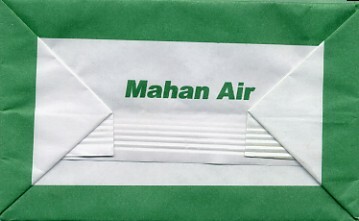 Identical to other plain Malaysian bag, except this one does not say ELAG on the bottom. Wow, is this a barf bag, a pot trivet, or the world's largest doily with a Klingon battle cruiser in the middle? 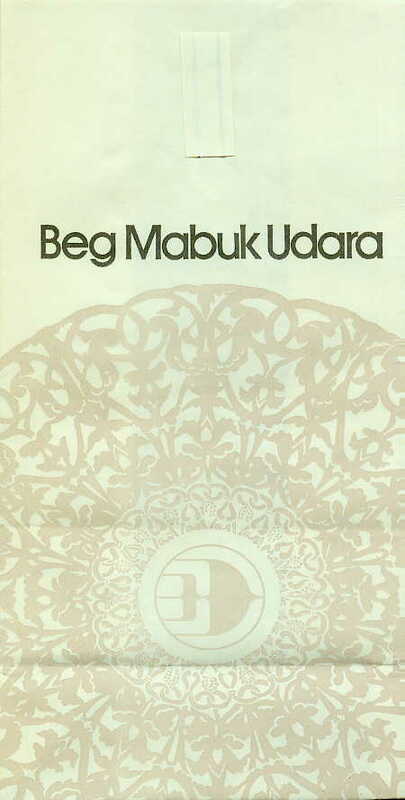 Whatever it is, some designer spent a lot of time with either a Spirograph or Benoit Mandelbrot. 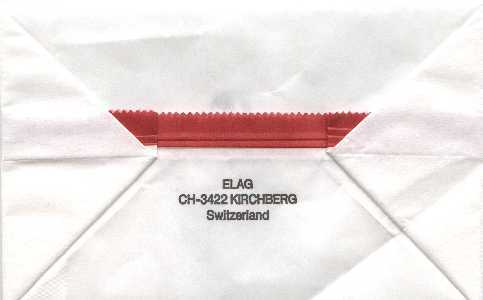 The thingie in the center of the bag is slightly different than this other similar one. Wow, is this a barf bag, a pot trivet, or the world's largest doily with an old TV tube in the middle? 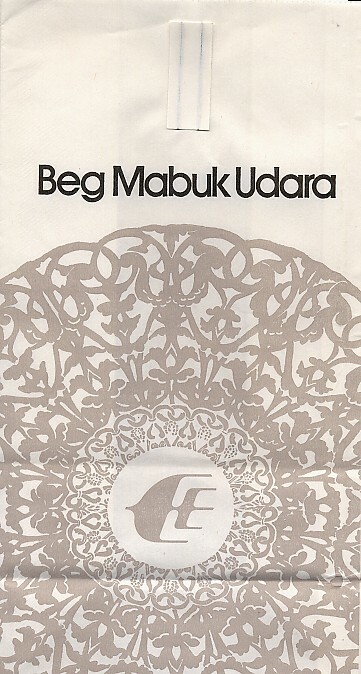 Whatever it is, some designer spent a lot of time with either a Spirograph or Benoit Mandelbrot. 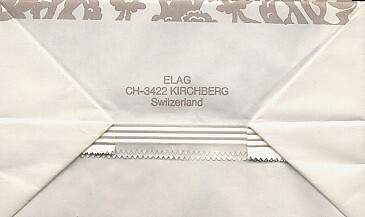 The thingie in the center of the bag is slightly different than this other similar one. 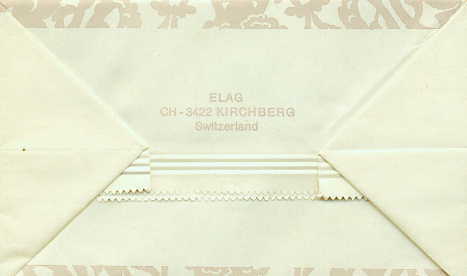 Identical to 2000 offering, except this bag wasn't manufactured by ELAG, as you can see by its absence on the bottom. 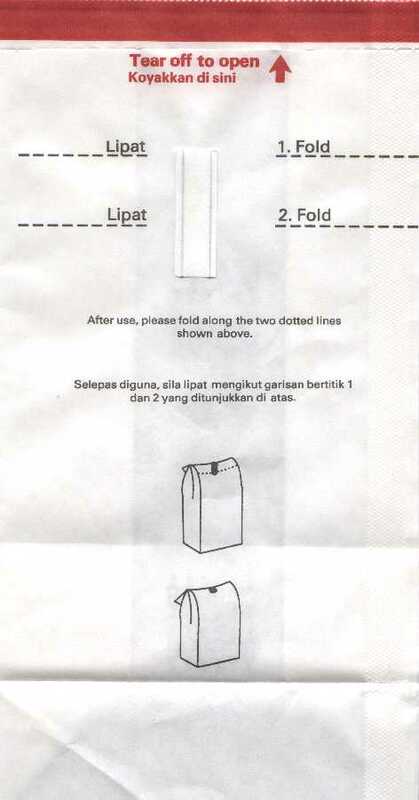 As an aside, the instructions on the back tell you to "Yang" something or other, which Y.L. says translates to "who be". 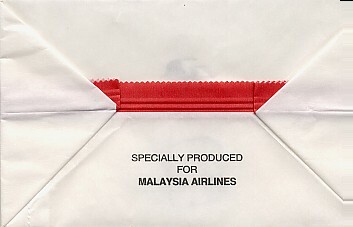 This bag differs from the other Malaysia 2000 only on the bottom of the bag, which says, "Specially Produced for Malaysia Airlines", which is a fortuitous happenstance because the airline's logo is printed on the bag. The bag changes, but still stays within the Malaysian motif, The design actually looks like some kind of background decor they'd use in designing an airport terminal. 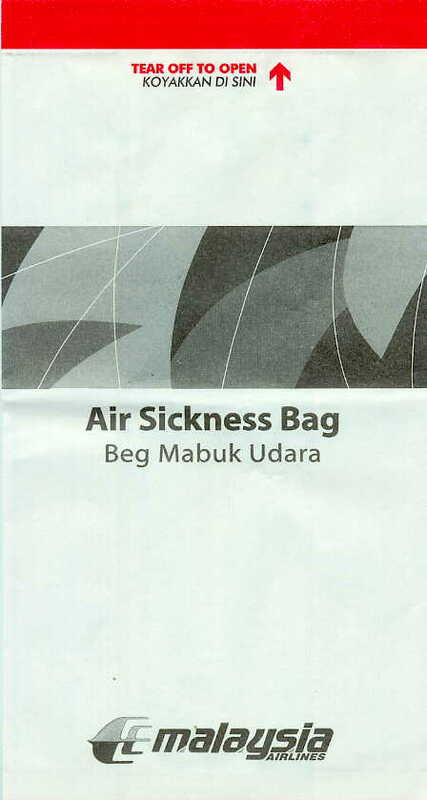 Copyright © 2019 Air Sickness Bags Virtual Museum. All Rights Reserved.